Finally, we have clarity around what is going to happen with Lightroom. For a long time, users were speculating about Lightroom 7 and how Adobe would make it available to their users. On October 18, 2017 Adobe announced Lightroom CC and Lightroom Classic CC, and at the same time the end of Lightroom 6. Both new Lightroom versions will be available only via a subscription. This article analyzes why Adobe made this decision, and what the future looks like for existing Lightroom 6 users with a perpetual license. I hope R.E.M. (actually one of my favorite bands) and Michael Stipe will forgive me for abusing one of their most famous song titles. Lightroom 6 is the last standalone version of Lightroom that can be purchased outside of a Creative Cloud membership. 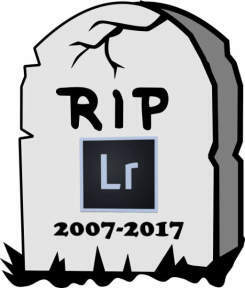 There will not be a Lightroom 7 perpetual offering. Lightroom 6 will remain for sale for an undetermined amount of time, but will no longer be updated with camera support or bug fixes after the end of 2017. Interesting wording, in my opinion. I would really like to see the numbers behind “overwhelmingly” and “over the last several years”. Until I see the numbers, I am not fully convinced. Operating income grew 48 percent and net income grew 55 percent year-over year […]. Impressive numbers, for sure. If you read the whole press release, you can see that most of the net income increase is based on growing subscription numbers. I found something really interesting when reading the full press release. Their expenses for Sales and Marketing are higher than the combined expenses for Research & Development (R&D) and General & Administrative (G&A). Don’t you think this reveals a lot about Adobe’s market orientation? 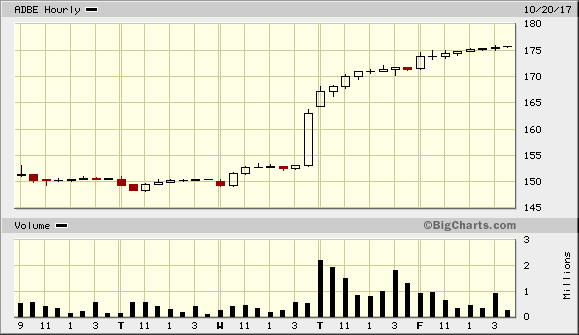 Within two days, the price of Adobe shares increased by more than 16%, from $150 to $175. In terms of market capitalization, this represents an increase of more than 12 billion dollars. Don’t get me wrong, I have nothing against Adobe making profit, and I have to admit that Adobe looks very attractive from a shareholder point of view. All I am trying to figure out is where Adobe is heading, and what it will likely mean to us as their existing Lightroom customers. Locking users into their cloud. If you have all your pictures in the Adobe cloud, the cost of moving them out and replicate the results off-line will become too high. Locking users into subscriptions. Once you subscribe, it becomes harder for you to switch. Your software will essentially stop working when the subscription is canceled. Bluntly speaking, the focus of larger companies like Adobe and Google is where the majority of their users is. Today, that is users of smartphones and tablets. Like it or not, as individuals who like to work on their pictures using a personal computer, we are now part of a shrinking minority. The majority takes pictures with their smartphones, apply some filters and shares the results on social media. This is where we are heading – the 30 seconds per picture workflow. Traditional knowledge about photography is no longer relevant. Google demonstrated it by killing the Nik collection, which was a highly respected piece of software among photographers. Apple demonstrated it when they killed Aperture. In this regard, Adobe was just following Google and Apple. Now you understand why Adobe is after the cloud and will be offering intelligent AI features – their target group will love it! We are just no longer part of the target group. I am sure that there are people out there who are fine Adobes approach, and will continue using Adobe software. But personally, I prefer not to be locked into something. Therefore I am looking at alternatives to the new subscription based Lightroom offerings. I also don’t like the idea of software regularly talking to activation servers – what happens if for whatever reason they are not available for a longer time? It is not likely, but what if Adobe goes bankrupt and their activation servers are shut down? Or hacked? Or the target of a DoS attack? Your software will stop working and there is nothing you can do about it. You paid for it, but if it works or not is not fully under your control. Technically it is possible to continue with your existing Lightroom 6 license. But its expiration date is already set. At some point in the future you will run into compatibility issues, or your new camera is not supported. Let’s stop moaning and grumbling and move on. So, what about the new Adobe offerings? Victoria Bampton (aka The Lightroom Queen) has written an excellent post comparing the features of the new Lightroom CC with the new Lightroom Classic CC, so I will not repeat it here. The new Lightroom CC is probably not what you are looking for. It is purely cloud-based at this time, and missing essential features compared to LR6, like plugin support. Lightroom Classic CC is probably what you should look at, as it is what LR6 users are expecting in terms of functionality. Honestly, I find the naming scheme for the two new Lightroom versions totally confusing, but that might be part of Adobe’s plan? Be very careful with your next Lightroom 6 update. There are reports of people who wanted to update their perpetual Lightroom 6 version, and ended up with a trial version of Lightroom Classic CC, and their Lightroom 6 was removed. On a personal note: based on what I wrote above, I am convinced that even Lightroom Classic CC will disappear at some point. It will likely happen when Lightroom CC has finally caught up with all the features offered today by Lightroom Classic CC. It just does not make sense to have two developer teams work on two versions of Lightroom in parallel. It is not that alternatives do not exist, there are actually plenty of them. Please be aware that this article will not provide comparisons between Lightroom and alternatives. There are already very good posts out there where people really took a lot of time to compare software. What I wanted to provide you is a list of what I personally consider an alternative to Lightroom. Be aware that based on how you use Lightroom today, you will probably rule out some programs immediately, because they cannot offer what you need. I would be happy to add additional programs to the list, but they should offer features beyond the basics of a pixel editor or raw converter. For this reason, I am not listing Affinity Photo or Gimp. Please leave a comment below so others can benefit as well. What does the end of Lightroom mean? Personally, I have not made a decision which software I will use in the future. I will definitely look at some of the alternatives. In the past, I have briefly tried Capture One, Photo RAW and the Luminar Beta, and now I will probably have a deeper look at Capture One and Photo RAW. For me, Luminar relies too much on presets, and this does not fit into my workflow at all. Honestly, I might end up using two or more programs in combination, to fulfill my needs. In the meantime, I will continue to use Lightroom 6 for my existing pictures and for my newer pictures, I will start working with the new program(s). Anyway, we have a lot of choices and we should be grateful for that. When the big players leave the playground, it opens up opportunities for the niche players. And I am convinced that one or more of those smaller and more flexible companies is already working on providing the perfect solution for us. As always: if there is change, there will be opportunities. You just have to be a bit flexible and detach yourself from the idea that there is nothing out there that can replace Lightroom. There is, I am sure. Personally, I really like the Adobe CC products and the subscription method of payment. I have never understood why this has angered and alienated so many people. I have run the numbers and I am convinced it is the lowest cost way to stay current with these powerful applications for an amateur like me. There are obviously some concerns about access if something happens to Adobe, but these are highly unlikely. I have a lot of time invested in learning and using these tools. I would prefer not to have to learn a new system unless forced to. That being said, I will NEVER be forced to move MY images to their cloud. I control where my images are saved! If cloud storage becomes required for continued use, I will dump Adobe in a heartbeat! There are alternatives, that while they may not be as powerful, they are certainly adequate for serious amateurs like me. 1). I always save my original raw files. 2). For all images I truly value, I export a DNG file with the lightroom edits. All files edited in Photoshop are saved as both PSD and flattened Tiff files. 3). I have an organized back up system. I always have 4 backups of every image file. Three are kept at home, with two in a fireproof safe. I keep a fourth offsite. After ingesting new images, I make the backups and carry one to the offsite location and bring the last from offsite to put in the safe. Theoretically at least. I can only lose images I have not ingested, and a few edits. Anyone using Adobe who is concerned should be able to come up with something similar so that they need not be feaful of any actions by Adobe. As for as I know, all serious editing programs will handle my raw files, DNG , and TIFF files. As long as we as photographers take a common sense approach to how we save and backup our images, I do not think we have much to worry about from Adobe. I should probably have made it more clear that I am less worried about the subscription, but more about the permanent activation checks. Should they ever fail to work, you are left with a piece of nonfunctional software and there is absolutely nothing you can do about it. It would not be the first time a software producer pulls the plug on activation servers for an older software version to “encourage” users to upgrade or move to a different solution. To me, this not an acceptable risk, however likely or unlikely it may appear today. The cloud model is something I would personally not even consider. I also don’t think this solution has been developed with a professional photographer in mind who owns multiple Terabytes of images, but rather for advanced smartphone users. In the end, it all comes down to choices. Give users (the right) choices, and they are happy. Take away choices from users, and they will demonstrate anger and frustration. If the new model is acceptable to you, good for you. Thanks for your thoughtful comments. Like you I’m frustrated with Adobe’s subscription set up and like you, I enjoy IR photography. Have you decided on an alternative to LR yet and/or known which program handles IR better than LR? Hi Michael, thanks for sharing your thoughts. Honestly, I believe that most of the current Lightroom alternatives need to mature, if they would like to stay relevant in the market. As bad as it sounds, but so far I haven’t found software which comes even close to the functionality of Lightroom. For now, I continue to use the last available standalone version 6.14 of Lightroom, while I continue my search. For me if you ask me today, I can imagine working with Capture One or with ON1 Photo RAW, but both are being developed heavily right now. I will give them a little more time, because at this point I have no immediate need to migrate off Lightroom. Thanks for your perspective. I had LR 6 as a upgrade from the LR5 on a Windows machine and then, getting a Mac attempted to load my disk and do the upgrade but couldn’t find it anywhere. Do you have an idea where one could find it? Also, any thoughts about the IR question? If you are looking for a Lightroom download, I have always downloaded the latest standalone edition from this Adobe link. Both Mac and Windows versions available. On the IR question: I will start testing with IR pictures only after I consider a product functionally complete (according to my personal requirements), so that might take a bit.